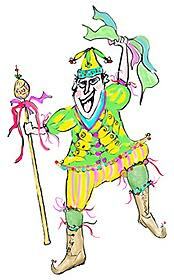 The Lord of Misrule is one of the lost characters of the riotous Medieval Christmas celebration. Sometime in November, it was customary among the European peasantry to draw lots for the title of Lord of Misrule. Wearing a paper crown and motley garments, the Lord of Misrule turned the ordinary rules on their head for his appointed time. He was given full licence to enjoy whatever pleasures he desired, and to lead the others down the merry path of dalliance and delight. One can only imagine what sorts of delight prevailed but certainly the kind that comes in a flagon must have been especially indulged. The crowning of the Lord of Misrule is a tradition extending back into ancient times, and was a feature of Roman Saturnalia. Records from as late as the 3rd century suggest that the merry reign of the king of the revels came to a rather unjolly end when the chosen one was unceremoniously sacrificed on the altar of Saturn. In the Middle Ages, the tradition was revived in a more moderate form, most sacrificial elements removed or replaced by the less barbarous practice of burning the god in effigy. A remnant of this ancient custom clings to the current practice of pulling Christmas crackers: after the muffled explosion of the cracker, the prizes are generally revealed to be a joke, a charm, and the paper crown of the Lord of Misrule.